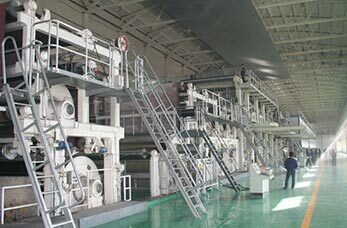 Cultural paper machine line is used for manufacturing culture paper (A4 paper, etc.). The cultural paper machine line also consists of two parts: pulping making line and paper making line. The raw materials that we use to make cultural paper are commercial wood pulp, white shavings and waste paper, etc. Firstly, Raw materials (commodity wood pulp, white shavings and waste paper) are conveyed by Chain Conveyor into Drum Pulper for pulping. Then, High Density Cleaner helps to remove all kinds of heavy impurities in the pulp. What`s more, we need to improve slurry beating degree to meet paper making needs by using DD Series Double Disc. Eventually, the waste paper turn into fine pulp after a series of screening and deslagging and it will be conveyed into Headbox for paper making. Forming part: After the paper pulp come into the headbox, it can spreads along the fine pulp evenly on the felts, which spread along the top and bottom of rollers. Press part: By pressing felts, it can squeeze out as much water as possible. Dryer part: Dryers section is arranged in group to ensure it can be operate at a gradually slower speed to compensate for paper shrinkage as the paper dries. It will discharge the water content down to a level of about 6%. Calender part: Calendering can help to make the surface of the paper more sooth and glossy. What`s more, It also can ensure consistent thickness of paper. The pressure given by the rollers applied to the web influences the finish of the paper. Rewinding part: To make it easier for shipping and conveying, we use rewinder to shape it into rolls and use slitter to cut the product into multiple strips to meet customers` requirements. Our cultural paper manufacture machine line can use commodity wood pulp, white shavings, and waste paper to produce A4 paper.